We introduced the Sixpoint BeerFinder in December, 2012, providing Sixpoint fans a way to find our product wherever it is distributed for the first time. 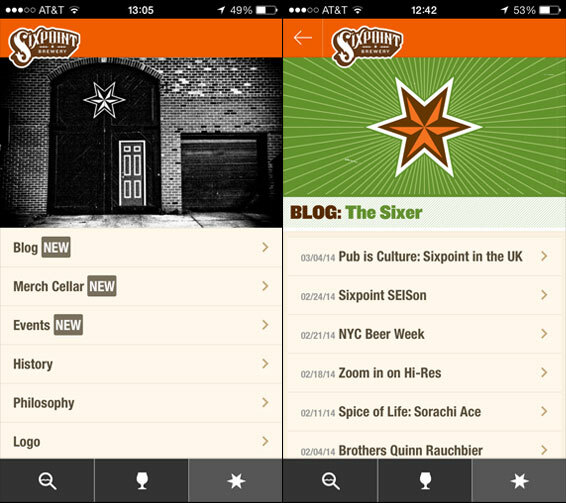 Then, so fans could search for our beer on the go, we released the Sixpoint Mobile App last July. Today we’re proud to introduce the updated BeerFinder. You may have noticed it in the top right of our site, in the nifty drop down menu. The update is more responsive and offers greater searching capabilities—instead of requiring a zip code, the BeerFinder now allows you to browse on the map, as well as search by city or address. It’s the experience of the BeerFinder function on the App, translated to your browser. Click here to go to the Sixpoint Beer Finder! We’ve also been working on updates to the App since we released it. We have an events section that keeps you apprised on where and when Sixpoint events, such as tap takeovers and rare beer releases, are occurring. (For additional event coverage, look to follow your local Sixpoint rep Twitter account. Our main account, @Sixpoint, will keep you posted on beer releases, blog posts, very noteworthy events, and all the great stuff happening around the brewery.) We’ve also embedded our blog into the App. All things Sixpoint, all in one place. As always, the App is the best way to track our beers on the go, and it provides a detailed description of all the Sixpoint brews currently in distribution, as well as some retired favorites. In addition, we’ve noticed internally—and some fans have pointed out—that you can use the App to seek out restaurants and bars with the same sort of style that you have. We love pouring our beers at great restaurants and bars, places that we have a strong relationship with, and that do great things. So we hope the App can help you seek out our long-time friends and newly made partners. We also have bars and restaurants around New York that supported us when we were a small company, and that we still repay with custom beers made just for them. You can locate these beers (and the great places that we love!) quickly and easily with the App. As we continue to release new liquid formulations, we’re working on more tech advancements as well. Keep an eye out for updates and new features in the future.